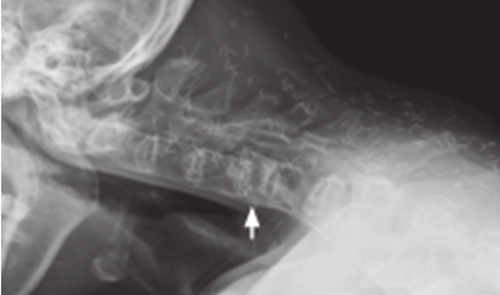 A 51-year-old man with a 22-year history of ankylosing spondylitis who had been treated with nonsteroidal anti-inflammatory drugs and infliximab presented with severe posterior neck pain, which had been aggravated after he fell backwards 3 months earlier. For cervical spine fractures in ankylosing spondylitis, conservative treatment with gentle low-weight cervical traction can be performed initially, in the absence of a neurologic deficit. However, secondary neurological deterioration occurs frequently due to the delayed dislocation at the original fracture site, and surgical treatment is generally recommended.